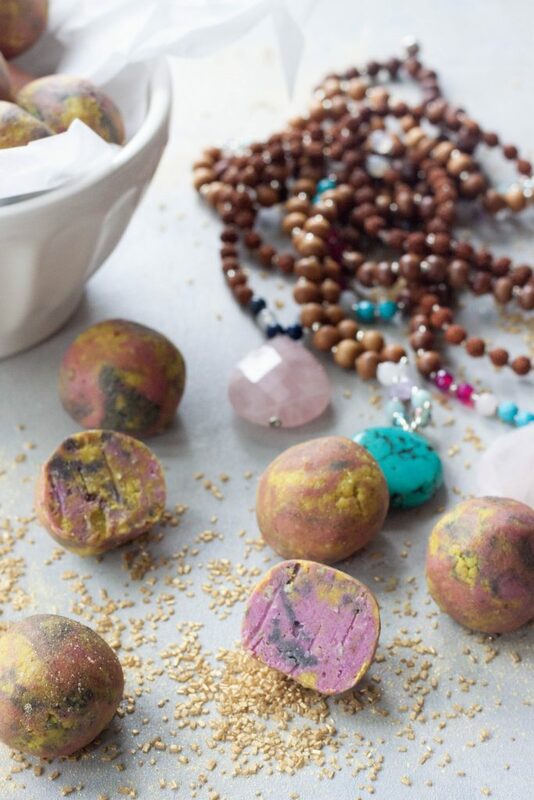 First a disclaimer, no unicorns were harmed in the making of these Unicorn Balls! A rainy day and cancelled plans gave me some time to catch up on things and relax. Instead of relaxing A and I decided to have a little fun in the kitchen between loads of laundry. The girls were also trying to decide on mala necklaces and customizing their own. We need all the positive energy and vibes right now and this was the prefect time for them to have mala necklaces we had talked about. Things will calm down, the sun will come out, and hopefully this summer the girls and I can even do a little yoga outside. Since A took a break to try to thing about what she wanted on hers we whipped up some fun colorful Unicorn Balls! I know I was on the fence with the unicorn trend as much as I figured my girls would love it. We didn’t get the Starbucks drinks because neither of the girls were interested in it when they heard what it tasted like. I did make them ice cream that one night but other then that haven’t. We’ve had our share of colorful smoothies in the past like my Tropical Kale Storm, Rainbow Smoothie, Peach Raspberry Electrifying Smoothie, Electrifying Green Recovery Smoothie, Green Dragon Fruit Smoothie, Blooming smoothie Bowl, Magnificent Magical Mango Smoothie… plus so many more colorful smoothies but none that I’d classify as unicorn just colorful smoothies. 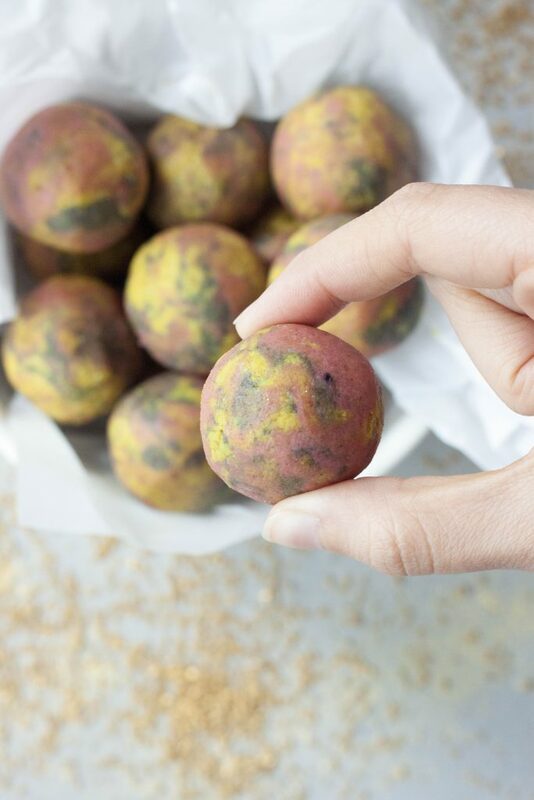 These colorful bites are naturally colored. We made a couple batches and used pitaya for pink, maui and blueberry juice for blue, tried some spirulina, and my favorite turmeric for yellow. You can use what you have around as this is a pretty versatile and adaptable recipe. We tested with powder and liquids and both worked. 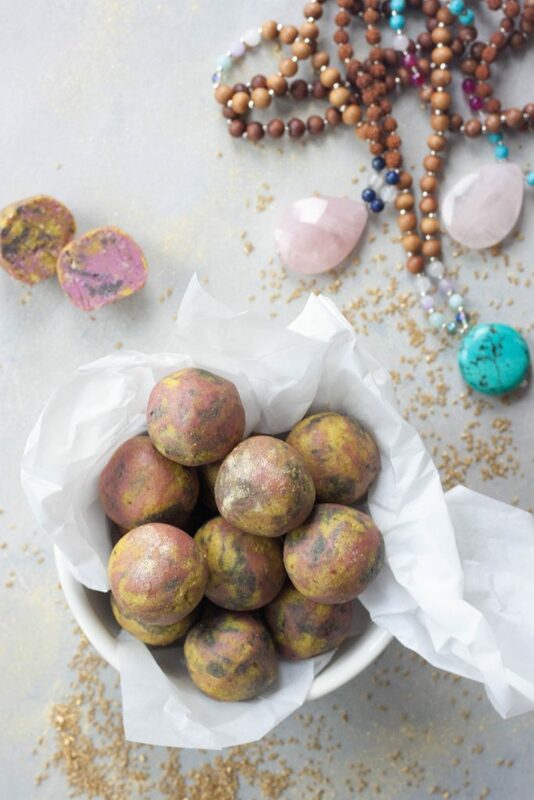 These balls pack some healthy fats and protein, refine sugar free, and are perfect for a little afternoon snack. They are fun and you can’t help but smile when you eat them and they are a great way to get kids to eat a healthier snack that will fill them up. Bite into them and it’s like breaking open a rock or marble to expose the swirls and bright colors. The colors are brighter inside and the only thing I can think of is the natural colors changing as they’re exposed to air on the outside. Coconut butter is easy to make, it’s just unsweetened shredded coconut that’s blended into butter. It takes less then 5 minutes in a Vitamix, slightly longer in a food processor. It’s dangerous to have on hand because you will find yourself spooning it from the jar. You can also purchase it. 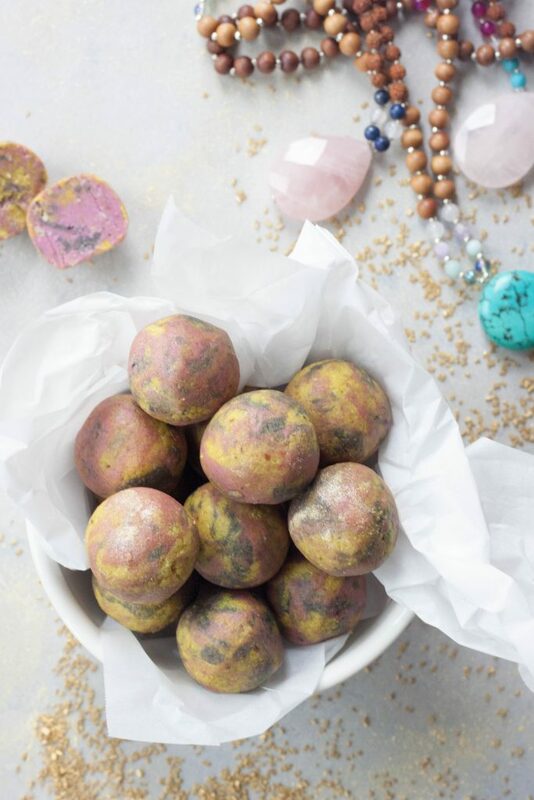 I am going to try making these with cashew butter but haven’t yet as I was craving coconut butter and also wanted to keep them light in color so it was easier to color them naturally and get bright colors. My little colorful A is going to be enjoying some of these at her Track & Field Day today. She will be that girl dressed in all the colorful bright colors with the brightest biggest smile on her face giving it all her heart and energy. This mama will be right there watching her and cheering her on and she’s so excited. I’m hoping the sun is shining and it’s a beautiful day for all the kids as it’s a day they look forward to. Options for natural coloring, matcha powder, pitaya (frozen or powder), turmeric, acai, maui powder, berry juice/puree, spirulina, or beets. We made a couple batches and used pitaya for pink, maui powder (Navitas Naturals) and blueberry juice for blue, tried some spirulina, and my favorite turmeric for yellow. *I make my own coconut butter, it’s just blending unsweetened shredded coconut in a Vitamix or food processor until smooth and creamy. In a food processor pulse raw cashews and coconut until you have a course flour texture. Add in almond flour and protein powder and pulse to combine. Pulse in dates until you have no large pieces. Last add coconut butter, coconut oil, and optional vanilla and or cinnamon, and blend until the mixture comes together. Divide mixture into 3-4 bowls depending on how many colors you want to have in your balls. Adding a little color to each bowl until you reach desired color. If using powder like turmeric you may need a little coconut milk. You are looking for a slightly wet playdoh like consistency. If using juice or liquid add a little almond flour if it gets too wet. Grabbing pieces of each color or rolling out into ropes and twisting roll into balls. Place in the refrigerator to set. After set store in an airtight container in the refrigerator. Enjoy! Definitely healthier than the coffee house drink but just as fun if you ask me. *unicorn balls* I’m totally making the laughing so hard it’s crying emoji face! Love this idea! 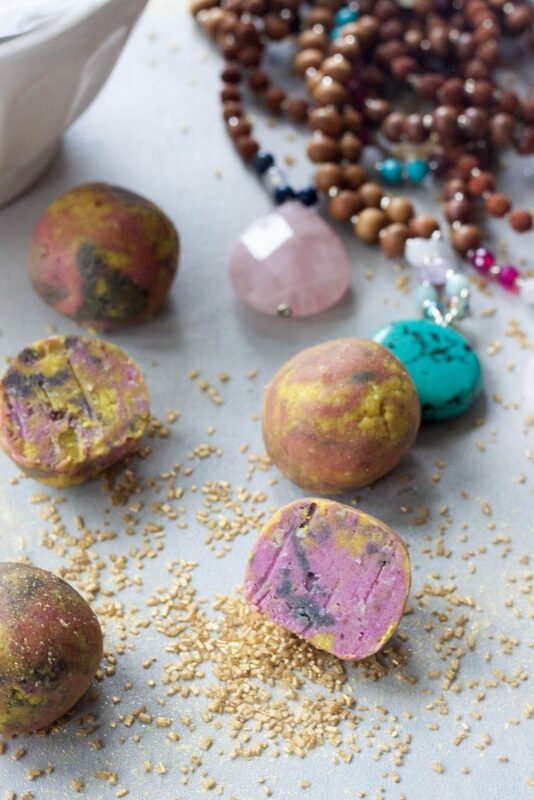 haha, I love how colorful and fun these are, and the different ingredients you used for natural coloring sound awesome! I need to check out htat maui powder! Thank you Farrah! There are so many color options and they are a lot of fun.